The RBNZ just signaled that it’s keeping the door open for another rate cut while the RBA minutes seemed less dovish than usual. Think AUD/NZD can keep climbing from here? Earlier today, the RBNZ announced its decision to keep interest rates on hold for the time being while citing that inflationary pressures remain weak, giving them reason to maintain an accommodative stance. This contrasts with the RBA’s relatively upbeat tone in the minutes of their latest meeting, which indicated that growth and employment are in line with their forecasts. The divergence in these monetary policy biases could be enough to boost AUD/NZD, although I’m a bit worried about the nearby resistance levels visible on the longer-term time frames. I already missed the actual descending trend line breakout on this one so I’m looking at a potential pullback entry if it does materialize. Price also broke past the neckline of a tiny double bottom pattern and has moved by approximately the same height as the formation so profit-taking could happen in a bit. 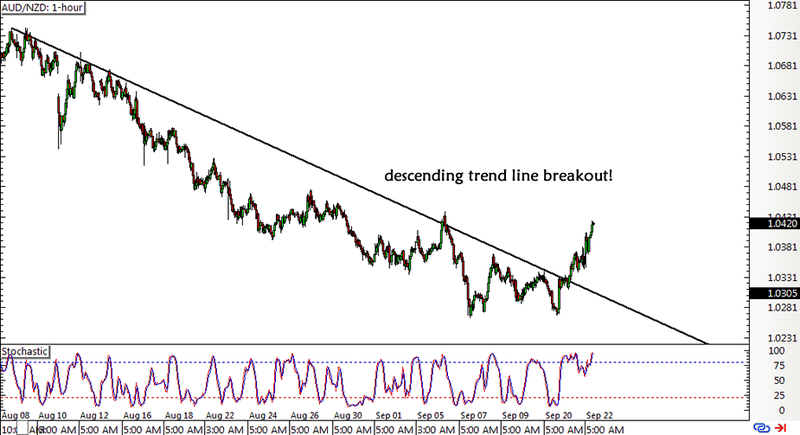 I’m eyeing a potential entry around the 1.0350 area, which is just around the broken trend line and area of interest. I haven’t set any actual entry orders yet but I’ll definitely keep y’all posted when I do. Stay tuned! Got any comdoll trade ideas you’d like to share? Post ’em right here! And don’t forget to check out our risk disclosure when taking any of these setups.